LIGHTS-CAMERA-ACTION……. THE MAKING OF A TV SHOW! A couple of weeks ago I got hooked up with a television producer that was filming 5 episodes of a TV show about people who do extreme sports. 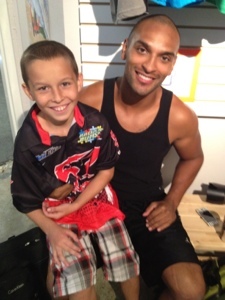 They asked if they could do an episode about me and dirt bike racing……YES! Last Friday we filmed the show and it was amazing! The whole thing was totally cool and it was really fun to see how it all works, I couldn’t believe how much goes into it. 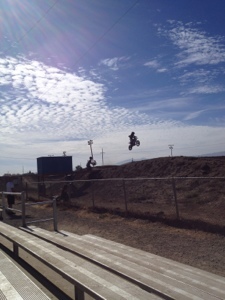 First I need to say Thank You to Ralph at 408MX for letting us shoot the dirt bike stuff at his track. 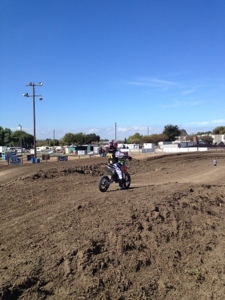 It was very strange when we showed up at the track because I have never been to 408MX and no one was in the parking lot. We got to the track early to get all my bikes ready to go. Shortly after we got there, a ton of people showed up to start filming the show…..they had several film people, photographers, production people, people who handled contracts that needed to be signed, and the hosts of the show. 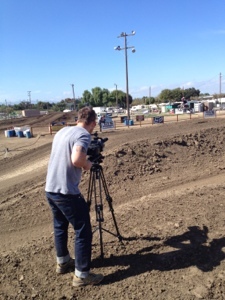 Soon it was time to start filming…The filming at the race track took about 4 hours. They would set up the cameras in a spot on the track and I would do several takes in that one spot and then they would adjust the cameras in a different angle and I would do the same spot some more. 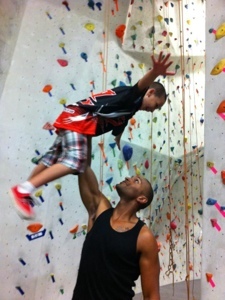 Then we would move to a different spot on the track and do it all again. 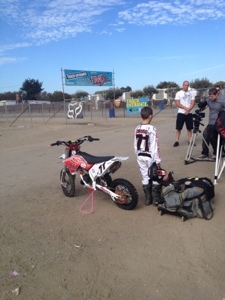 Before I even got on the track we did about 7 takes of me putting on my gear and starting my bike. 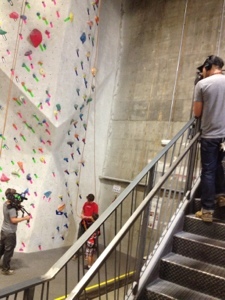 It was really cool they would start with the cameras far away from me and by the end they were right on top of me. 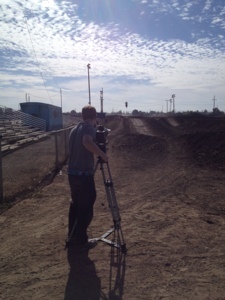 Then I waited while they set the camera’s up in a different spot on the track. 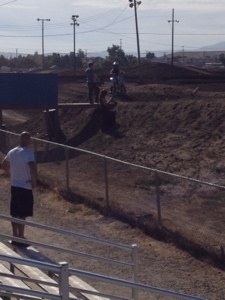 We did this in about 7 different spots on the track. They would tell me what kind of shot they were trying to get and what part they would be filming and I would try to jump right in the spot they were at. The guys wanted to stand on the track to get the closest shot, but I think they were a little scared I was going to land on them. I convinced them that they could stand on the track and I wouldn’t hit them and I think they got some really great shots. 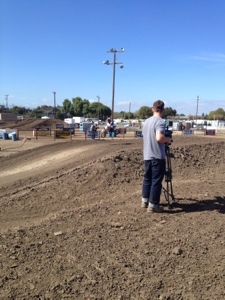 After we were done getting all the shots of me riding, it was time for me to be interviewed with one of the hosts of the show. I was interviewed by Josh Williams who was totally fun. Throughout the day Josh and I started picking on each other and got real silly, you will see that part in a little. I think the interview went well. 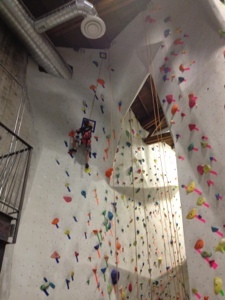 I was a little nervous at first, but I started having fun with Josh and then it was better…..I hope! 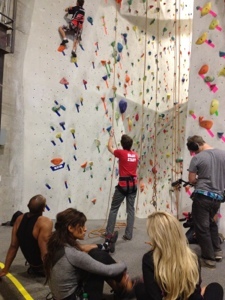 After the interview, the hosts and I had to go and shoot at the second location…..Rock Climbing. 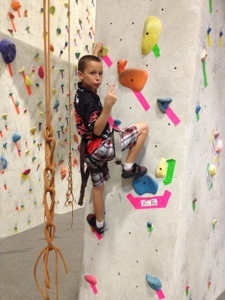 I had never been rock climbing before and I was a little sore from riding all morning (because I haven’t rode in 2 months because of my broken wrist) But, I was ready to go! 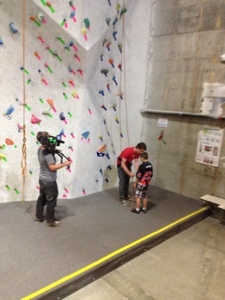 We waited for the cameras to get set up and then it was time to start climbing. 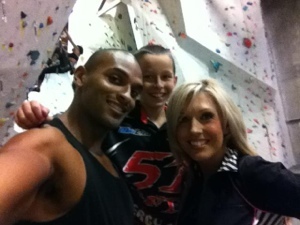 We did 3 different climbs and it was me and each of the three hosts of the show (Leila, Karyn, and Josh). 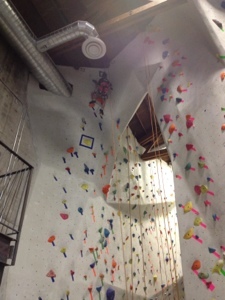 The cameras set up one on the ground and one up on the second level and I started climbing. 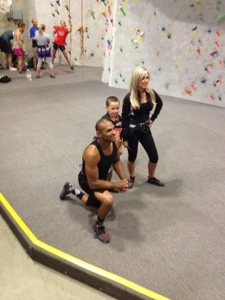 After my climb, I watched and cheered on each of the hosts, and we all took turns watching. Between takes I liked to pick on Josh and he and I had fun messing with each other. Thanks for having fun with me! We finished filming for the day, but I do get to see everyone again for a third location that we will be filming at in about a week……I CAN’T WAIT! 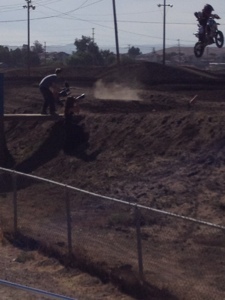 I got to see some of the shots through the camera that they took of me riding and it looked AMAZING! I can’t wait to see the show and what it will all look like put together. I will keep you all posted when all the editing is done and after it is given to the network. The whole experience was amazing and I was so lucky to have been given the chance to experience something as cool as making a TV show…..it is a lot more complicated than I thought it would be. I HAVE TO GIVE A VERY SPECIAL THANK YOU TO LEILA HAUCK FOR CHOOSING ME FOR THIS EPISODE! 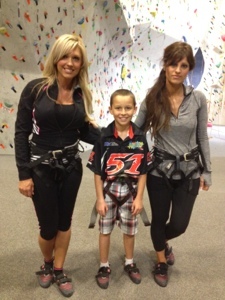 Please support Leila, Karyn, and Josh! 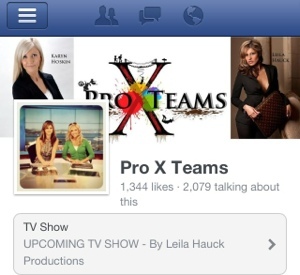 Make sure you LIKE their Facebook page (PRO X TEAMS) to see upcoming show information.